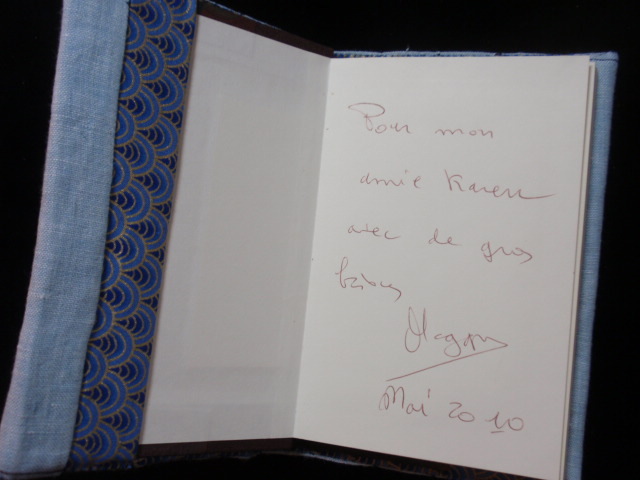 If you check my post of May 8th you will see a couple of gifts I received from my friend Maggy in an exchange. I received another gift from her for our exchange. It was really only supposed to be just one small item…but she made me not just those first two items, but another one now as well..!! I love this small book cover she did. 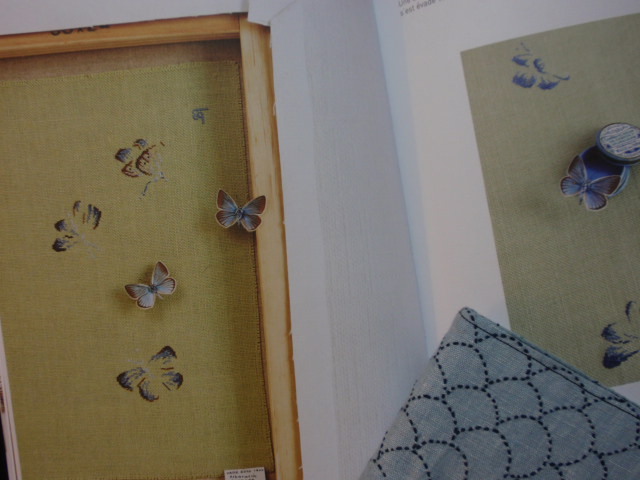 I love sashiko stitching and hers is so tiny and exquisite. The pale blue fabric is lovely. 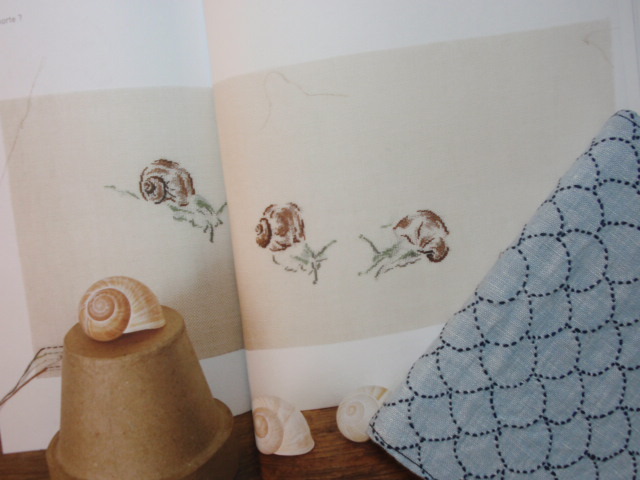 And the fabric inside that lines the sashiko has the same clam shell motif….it’s perfect!!! The book inside has blank pages. This is just the kind of book I like to carry in my purse to jot down spontaneous notes when I am out. Thank you SO much Maggy. Maggy knows that I really like the work of Marie-Therese St. Aubin. 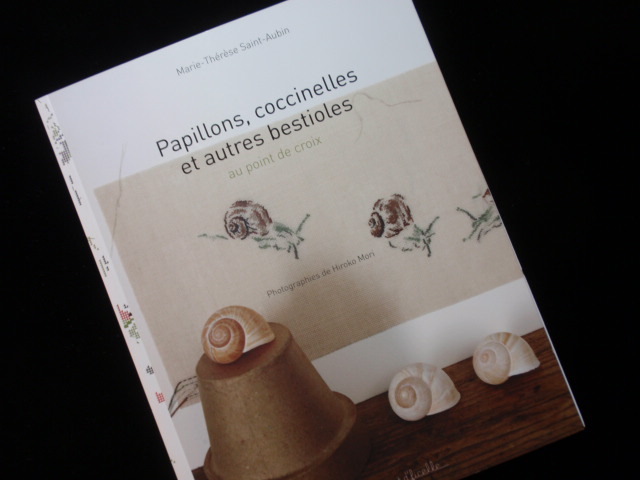 She also included in my surprise package, this book…”Papillons, coccinelles et aures bestioles.” Here are some photos of the book and a couple of the inside photos. It is such a beautiful book. It is surely on my list of projects now. I just LOVE the snails!!! 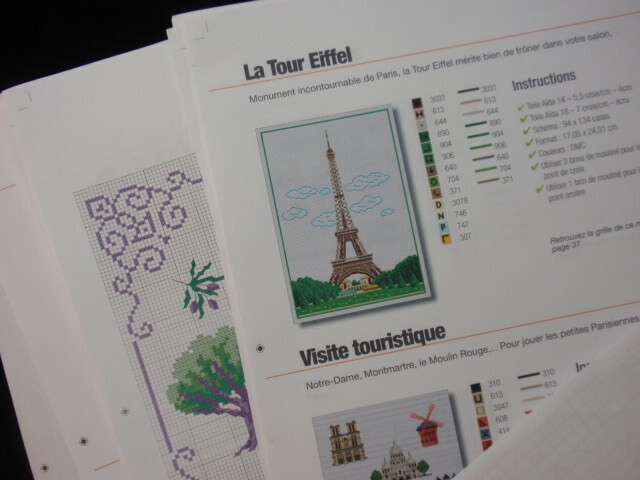 And last, but not least, Maggy included for me some computer print-outs of French cross-stitch motifs….MORE for my list of projects…I just love them. 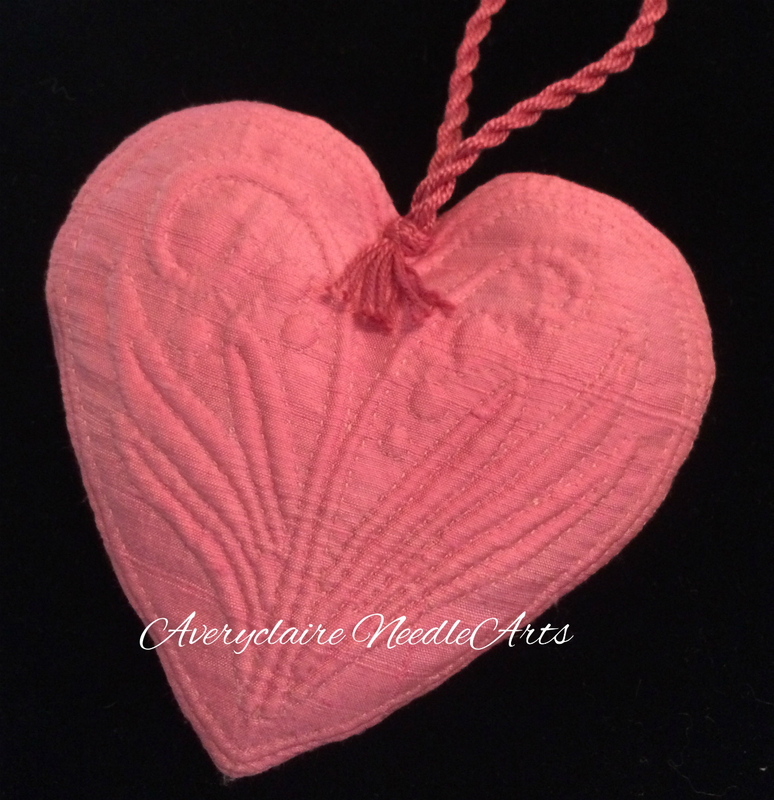 Thank you again Maggy….I adore ALL of my surprises. What an exchange!!!! What a lovely surprise. There is something very appealing about the shape of snail shells. What a lovely gift! 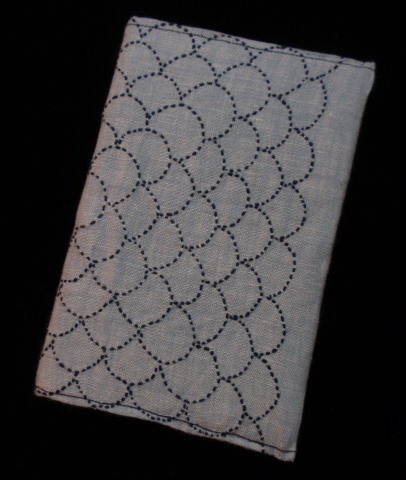 I’ve never tried sashiko, but I’ve been tempted to try my hand at it a few times. Beautiful work! You must be thrilled to have received it! Such lovely gifts! 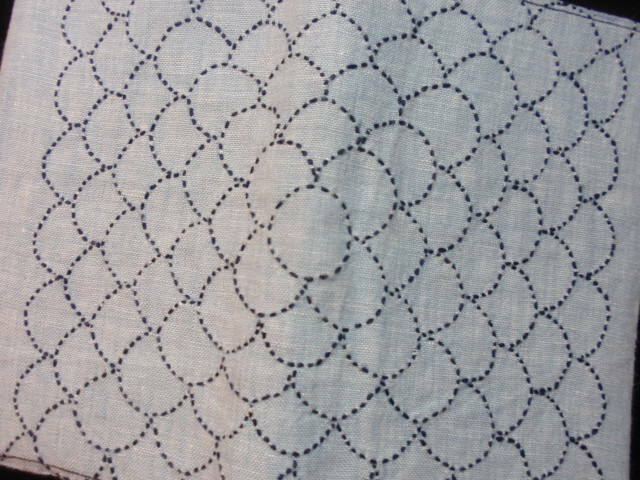 Sashiko is on my to-do list. What a beautiful exchange gift. Maggy was just right : This Marie-Thérèse Saint Aubin’s book is just the one you needed! Her designs for stitches are so cute!